The recent Kawaihae Fire burned over 4,500 acres of wildland in the Northwest region of Hawaii Island. The wildfire directly impacted local communities, businesses, and cultural sites. One week later, the wildfire impacted coastal resources through unprecedented levels of post-fire flooding. Watch this video to learn about the impacts of wildfire from mauka to makai with footage from the recent events. We have a special message at the end of the video about how you can Take Action! Don't be caught off your toes during wildfire season! Get your hands on a free copy of Ready, Set, Go! 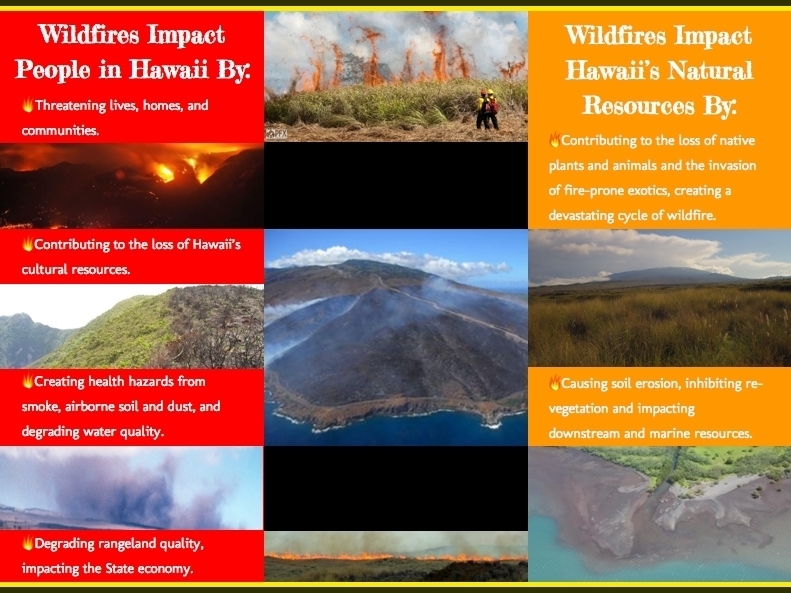 Hawaii - Your Personal Wildland Fire Action Guide from us today. Now's the time to reach out to your neighbors and organize a community fuels reduction project (free chipper days, tree services, etc.). This is an important step towards becoming a Certified Firewise Community. We have funding until the summer of 2017 to help establish your community as a Firewise Community.